Dreams really do come true! Climbing Mount Apo and reaching its summit is just but a dream, now finally it has become a reality! “Dreams really do come true! Climbing Mount Apo and reaching its summit is just but a dream, now finally it has become a reality! 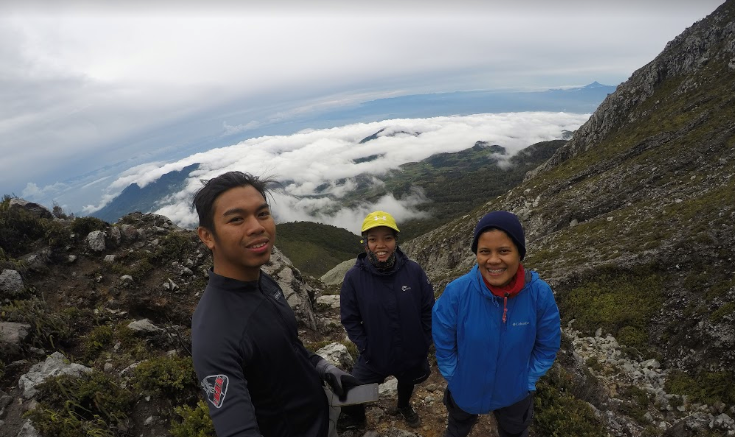 My first major climb to a mountain’s peak and to the highest one in the country has become possible last June 30 to July 2 of this year through Discover Mount Apo’s team #DiscoverMountApo. Doubts troubled our minds, weaken our hearts. Ask for help if needed. As we started on foot, climbing that steep hill carrying my pack bag going to Sitio Colan which for seasoned climbers was just some sort of ‘warm-up’ seemed to have drained all my energy abruptly. That moment hit me in the head that my preparation was not good enough, as I was catching up my breath so heavily and there was a second right there that I doubted myself if I can do it. Perhaps, my body did not feel well because it so happen that I had my monthly period. My thoughts were “Why it has to be now?? ?”, though I see ‘it’ coming already. The struggle was so real, it was so tough. I thought my body would gave up on me, but I made it through rain or shine! Thank God! Thanks to Kuya Nel our porter for carrying our bags right where it needed it to be safe and sound. Kudos to #TeamDMA superb guides and pro-ecology warriors Francis, Oliver and to the ever patient head guide and ou r ‘sweeper’ Elvis. Shout-out to my life savers, Romeo, Jen, Margot, Dominique and Mae. Believe in yourself, don’t let your dream slip away. Listen and be prepared. It was 22 days before the big day that I confirmed my registration, still waiting for my travel buddies to sign up, then I was good to go (at least in paper though)! For me, it was helpful to research, read the tips and blogs, even to watch the videos too on the page of www.discovermtapo.com. The checklist given to us and the online communications made it hassle free. 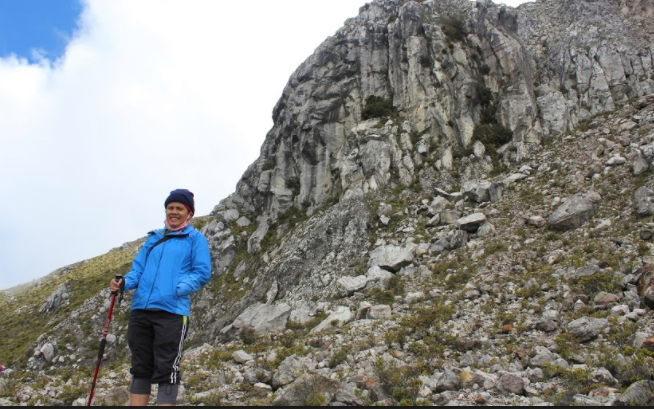 But to know a ‘bit’ of what was there gave some apprehensions, actually the decision to pursue this was not quick and easy because we expect that June-July comes with a rainy season and that surely will truly be a difficult and dangerous climb up there! Fortunately, God was so good and the weather was bearable for all of us. Our clothes were secured from getting wet as it was packed with plastic bags, thanks to the immediate advised by the #TeamDMA. It rained in the afternoon of day 1 (June 30), and on day 2 (July 1) while we were at the peak waiting for the sunset. Lucky we finished our dinner just right on time before the heavy rain poured at Campsite 2; the night was freezing until morning of the third day (July 2). Go beyond the limits; Mother Nature will provide. The Trail tested our limits! Our endurance is not limitless, we also got tired but Mount Apo has given us beautiful resting sites along the way where we can fill our lungs with oxygen, look around various plants, take a sip of refreshing water chilled by nature’s low temperature or even mingled and talk to our fellow climbers. As we jumped off from Sitio Tampis, huge rock nestled in the grassland, dead trunk of anotong or tree fern, the rock in the Tinikaran campsite carpeted with mosses, the Lion’s Head, and the great boulders became our oxygen-charging-stations. Mount Apo was so gracious it provided climbers sweet berries along the boulders to quench thirst and soothe dry throats while heavily gasping for oxygen in the air mixed with sulphur gas. We can be pro-ecology warriors in our own little way. The damage to Mount Apo Natural Park due to the forest fire more than a year ago still remains visible. The dead and burned shrubs were still there, around the crater and along the other side of the ridge. Ferns were growing on the ground below these shrubs, I think it must be the start of recovering. We saw that our Mount Apo is still is starting to heal and re-opening it may pose some disturbances again. This trek made me see the flora that was there for the very first time, some of which are threatened like the Tree Ferns or Anotong, didn’t expect to see relatively visible Lycopodium (or Lycopodiella) along the grasslands and at White Sand campsite, and fern that is difficult to find like Ophioglossum! There were unique plants, trees, ferns and mosses that we have not identified, unfortunately. My trek buddy was captivated by the beauty of mosses which have so delicate and very fine unique structure. We saw birds inside the forest unknown to us and even in the boulders. I just hope that the wildlife told to us by our humble guides are still there existing and not struggling to live. I commend our three guides for dedicating themselves as volunteers in putting out the forest fire more than a year ago. Chasing sunset or sunrise may fail, but there is always a rainbow after the rain. All the physical hardships that we went through the trail and the thoughts running inside our heads were eventually blown away by the cold wind as we reached the summit! Our faces were painted with smiles and full of wonder and amazement of the great creation and the magnificence of Mount Apo. Though we have not witnessed sunset, we have seen rainbow like no other! https://discovermtapo.com/wp-content/uploads/2017/10/22366487_876540902500685_3393612126601497691_n.png 439 926 A&D Admin http://discovermtapo.com/wp-content/uploads/2015/12/Discover-Mt-Apo.png A&D Admin2017-10-11 10:47:392018-03-22 06:02:26Dreams really do come true! Climbing Mount Apo and reaching its summit is just but a dream, now finally it has become a reality!